5 triangular cups fit together in a circle / Coffee/Tea pot / 4 serving plates / Sugar / Large Plate. Cermaic material in colorful, classic Memphis Collective graphics. Perfect condition. Bought it directly from Stendig? in the 1980s. Greetings and thank you for calling upon the experts at Mearto to evaluate your porcelain coffee service. 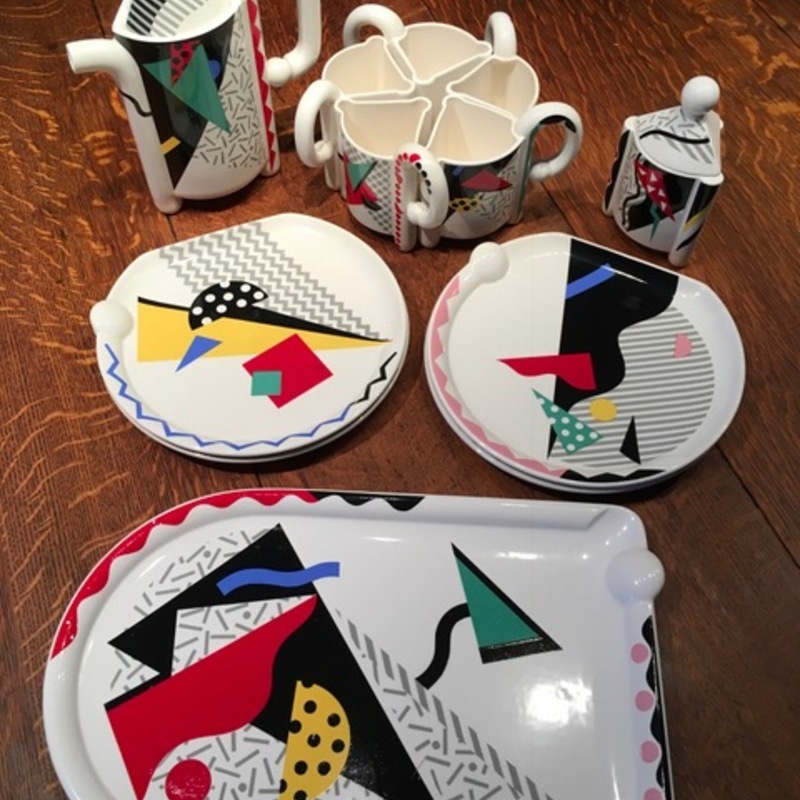 This service was designed by Fujimori for Kato Kogei Ceramics and is in the 'Carnival' pattern, very much in the style of the Memphis Movement. You service is currently quite collectible and because your set includes the coffee pot and sugar bowl, which are offered much less frequently than the cups and plates and additionally because all of the pieces are free of chips, cracks and repairs, at auction a similar service could expect to bring between $200USD and possibly as much $450USD in the right setting. Thank you for submitting this set to Mearto and let me know if you have any follow-up questions.